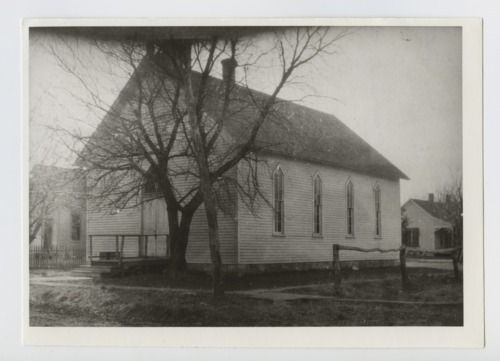 This black and white photograph shows the Methodist Church in Richland, Kansas. Built in 1884, the single frame structure was only the second Methodist Church in the state. Rev. Riggle served as the congregation's first minister. In 1894, a sidewalk was built around the church. The town of Richland was abandoned in the late 1960s and early 1970s when the Corps of Engineers acquired land in the area for the flood plain of Clinton Lake in nearby Douglas County. Today, the only remnants of the town are broken pieces of pavement that once covered the streets.